These ribs are coated with a Carolina style rub and basted with a tangy red pepper sauce. A truly delicious experience! Prepare ribs by removing the membrane from the underside of the ribs. This is best done by using a blunt knife to work the membrane away from the bone on one end of the rack and then grabbing it with a paper towel. It should come away easily and with a little practice, you will be able to do this quickly. Trim off any loose fat or meat. Prepare smoker or grill. If using a grill you will want an indirect heat. You will want to hold a temperature around 225 degrees F/110 degrees C for 4 hours, so plan accordingly. Season ribs with Carolina rub and place on grill or in a smoker. 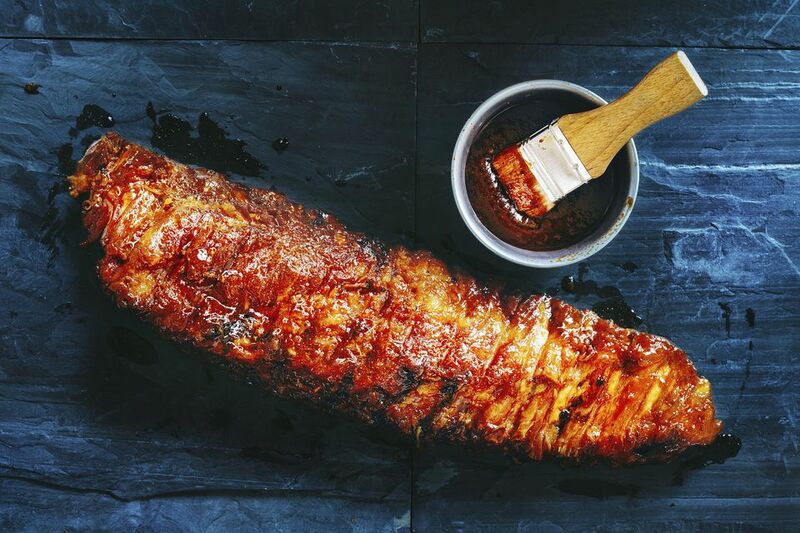 While ribs are cooking, prepare barbecue sauce. Mix all ingredients in a saucepan and simmer on low for 10 minutes. Remove the sauce from the heat and set aside. When sauce cools, reserve half the sauce for serving. Cook ribs until the internal temperature of the meat reaches a temperature around 185 degrees F/85 degrees C. Brush with barbecue sauce. After about 10 minutes turn the ribs over and brush with sauce continually during the cooking process. Serve with reserved half of red pepper sauce.